Get out there and deliver this package! It is just another day in the life of Cole McGrath, bike courier. Or is it? Cole’s life is changed in an instant, and his destiny is to become that of the saviour (or the destructor) is revealed. How will your story playout? 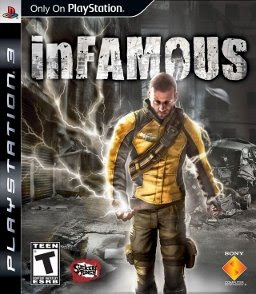 I chose the life of the hero for my first play though of inFAMOUS. A do-gooder set on the path of restoring order to a chaos ridden Empire City and the liberation of it’s inhabitants. The story line for inFAMOUS finds you in the shoes of Cole, a man forever altered by the explosion caused by the Ray Sphere – a mysterious device of unknown origins – that is detonated in the middle of a standard bike courier delivery. Finding a changed city after recovering you venture out into the wild armed with only your newly acquired powers. Lighting at the tip of your fingers, enhanced strength and the ability to jump and climb almost any surface (except Chain link fences?). Like me you will spend a lot of time scaling buildings only to turn around and then jumping from them. It’s more fun then it sounds – Trust me. Even thought Cole’s powers are great they are not endless – keeping track of available energy sources adds to your struggles – as you progress to portions of Empire city that have no power and you find your self in need of a recharge. Also I found it somewhat disappointing that the completeness of a “Good” story quest prevented you from returning to complete the “Villain” portions of the story. I’d like the option to do both, not just one or the other after the main story line was completed. Character development happens in a number of different ways; 1 – Earn experience for fighting enemies (bonus for combos, head shots and live captures), 2 – game progression, new powers are added to your repertoire as the story progresses by completing key objectives and 3 – Following the path of the hero or villain and completing the side quests to build skills. Maxing out as many skills as possible will make the later parts of this game much easier – almost too easy in some cases. There are also a few skills (specifically Thunder Drop) that I feel were not very useful and avoided the upgrade points needed to strengthen these skills are better spent elsewhere. The story is full of (un)helpful NPC’s ranging from your best friend Zeke – your bumbling best friend who wants to be just like you, Trish your girlfriend who wants nothing to do with you. You will also spend a lit of time with Moya an FBI agent that gives you key intelligence and objectives making her a useful story progression tool. Moya also introduces you to another agent John, a deep under cover operative that your going to spend a number of missions investigating and getting to know. There are also three other characters your going to spend some time with, but I’ll leave these to you game play as many of your in game actions will determine how they will interact with you as you progress. The combination of character personalities, flaws and idiosyncrasies provide great direction in a sandbox world like Empire City. The voice acting for the main NPC characters is top notch, believable and well acted. Accompanied by a story line that is both well planed and well directed your going to find your engrossed in the lives of Cole and his friends. I was pleasantly surprised with story plot twists and unexpected interactions from the citizens – tossing stones and fighting along side Cole to defeat the numerous enemies and the paparazzi effect. A title all PS3 owners should have in their library. Still not sold on this title? Go check out the three part online graphic novel. Now it’s time to get my villain on!